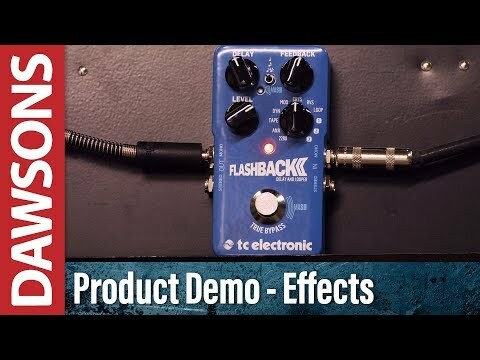 The TC Electronic Flashback 2 Delay Guitar Effects Pedal takes the already gorgeous delays offered by the Flashback series, and adds amazing MASH technology for pressure-sensitive expression control built in. The redeveloped and redesigned Tape and Analog algorithms painstakingly recreate the nuances and realism of old-school echoes for rich, sumptuous tones. Not only that, but the coveted shimmer effect of TC Electronic's Sub 'N' Up pedal's Crystal delay has also been included. Topping it off, there are three TonePrint slots for you to take advantage of! There are eight studio-quality delay types to access that include the redesigned Analog and Tap, and Crystal delays. Simply adjust the Type selector knob and you're on your way. The Delay knob dictates the delay time from short echoes up to 7 seconds of delay. In Tape and Analog modes the pitch of the delay can be altered using the Delay knob too. Feedback attenuates the amount of repetitions, and the higher you go the trippier the oscillating output. The Level knob determines the output level of the delayed repeats from adjusting a tender nudge to a forceful kick in relation to your tone. The Subdivision mini toggle switch allows you to choose between repeats in quarter notes, dotted eighths or both combined. With the TonePrint Editor you can explore even more subdivisions. The clever crew at TC Electronic push the boundaries of what can be achieved with every release, and their MASH technology is yet another innovative feature that makes you wonder how we've ever done without it? MASH turns the footswitch into a pressure sensitive expression pedal, i.e. the harder you press, the more intense the effect. MASH can control a different parameter with each different delay, and can be edited using the TonePrint Editor to do whatever your heart desires. By now I think we are all aware of TC Electronic's awesome TonePrint tech, but for the uninitiated, here is a brief overview. TC's TonePrint editor allows you to dive deep into the world of patch editing, and enables you to create your own TonePrint's from scratch. In the case of the Flashback 2 Delay, you can control effect behaviour, knob ranges, and everything in between. Alternatively, you can select one of TC Electronic's many TonePrints that have been created by some of the world's top artists. The Stereo or Mono connectivity of the Flashback 2 Delay gives you a choice with regard to how you handle the pedal, and your tone. Should you wish, an optional external tap tempo switch can be connected to the Stereo input to make it easier to tap out your tempo. Also, depending on how you arrange your pedalboard, the pedal adheres to TC Electronic's True to Tone philosophy, which puts a wealth of control in your hands. With optimised headroom, True Bypass or Buffered Bypass, and Kill-Dry on/off options available, the TC Electronic Flashback 2 Delay guitar effects pedal is ready for anything.